My name is Colleen Barrett, and I am a native of South Bend, IN currently living near Philadelphia, PA. During my freshman year at Purdue, I told those who asked about my five year plans that my main goal was always happiness, hence my choice to major in a field I loved. Nowadays, when I’m not working with books I enjoy cooking, reading, traveling, and volunteering with professional organizations like the Rare Books & Manuscripts Section of the American Library Association. Thanks to a field trip to the Lilly Library at Indiana University as part of Professor Johnston’s History of the Book course my junior year, I discovered I could actually get paid to work with old books! This led me to seek out a Master’s of Library Science (MLS) with a specialization in Rare Books & Manuscripts at Indiana University, Bloomington, before spending a year cataloguing the Clara Peck Natural History Collection at Transylvania University in Lexington, Kentucky as their Rare Book Cataloguer. 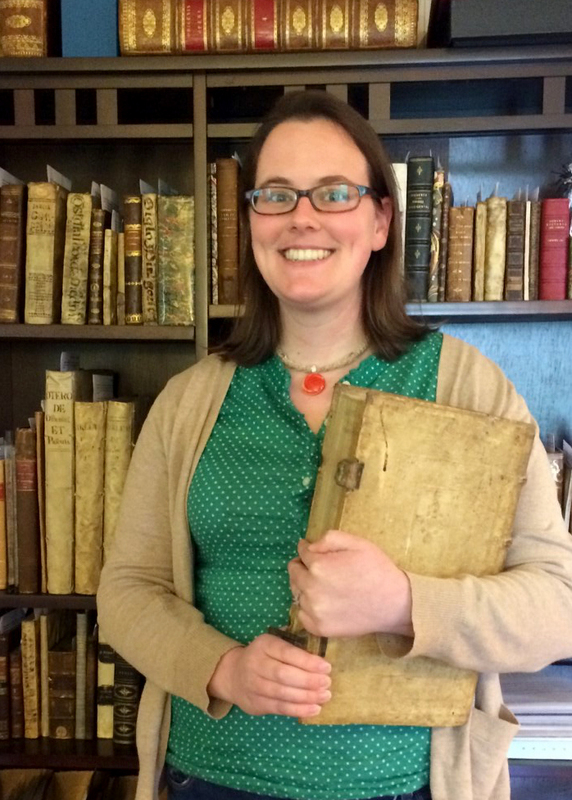 This experience and my passion for descriptive bibliography led me to accept a position as a cataloguer at the Philadelphia Rare Books & Manuscripts Company, an antiquarian book firm specializing in early books of Europe and the Americas. A typical day includes researching and writing descriptions for the rare books we sell as well as preparing orders for shipment, answering email inquiries, posting on our social media, or working on small projects related to collection management (we have several thousand books in our stock). I am also currently working with my bosses to develop a collection specialty, which means I will have a purchasing budget in the future for items related to that topic. Who is/was your favorite English professor at Purdue? The best part of attending a place as large as Purdue University is having such a variety of professors to choose from, all with different research interests and the ability to teach very specific courses. Picking only one favorite would be impossible, but I found Professors Powell, Pacheco, Lamb, and Hughes to be the most influential on my way of thinking and understanding the world around me. One of my favorite Heavilon Hall memories was the first time I visited Professor Hughes for office hours. Wandering upstairs, I walked into what appeared to be either a maze of densely packed bookshelves or gateway to another world. There were so many different texts in countless languages! After tip-toeing far enough in to gently announce my presence, I found him huddled behind a desk full of papers (and even more books) ready to help. How has your English major helped you in your professional career? My major drastically improved my ability to express myself clearly and concisely, an important skill in any profession, but especially in the somewhat intimidating and specialized world of rare books where no two collectors or librarians know exactly the same thing. No one wants to read a three-page description of why a book is influential when he can get it in two sentences somewhere else. My final projects taught me the valuable research skills I use on a daily basis and always encouraged curiosity, a very necessary trait when working with a previously unknown work or trying to uncover the significance of a certain edition. And who is your favorite author and/or what are you currently reading? My two favorite authors are Neil Gaiman and Kurt Vonnegut, which probably reveals my love of science fiction and fantasy. Right now I am working on Mort(e) by Robert Repino, a novel following a warrior cat’s experiences after ants start taking over the world, and The Not-Quite States of America by Doug Mack, a travel diary exploring the United States’ territories.